“I’m sorry, what? You mean France, right Dad?” my sister Kate corrected. “Hmm? Oh right, well, you see, Grandpa lived in France, but he was basically Italian,” my dad started to explain. As it turns out, polenta is, in fact, more Italian than French. 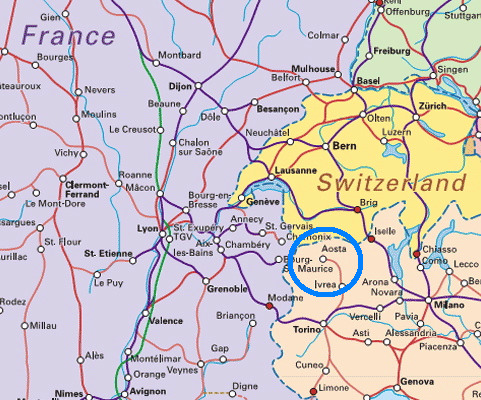 My grandfather did speak French, but he was born in Pont Bizet, a town in the Alps that may or may not have belonged to France at the time of his birth. It’s near Aosta, Italy (where there is a Piazza Chanoux - we're hoping we're distantly related to its namesake). It turns out that my family might be a little more Italian than French. 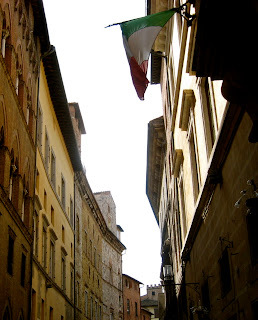 Our last name is undoubtedly French – you don’t see too many Chanouxs in the Italian phonebook – but my grandfather’s given first name, Octavio, had a more Italian sound to it. 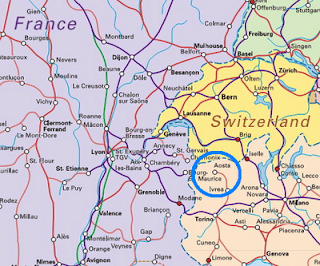 I've circled the largest city near where my grandfather was born. Note its proximity to the France-Italy border. Also note which side it is on. Our more recent Christmas Eve tradition has been listening to the re-telling of the polenta story, but with questions of geographic and national origin somewhat glossed over. Whether we're wishing each other a Joyeux Noel or a Buon Natale, we get to celebrate together and the polenta is delicious! I was about to comment on the polenta e Italiana thing, but then you mentioned it. It's cool that your name is on a Piazza in Italy! Whether or not you're related to the people (sometimes people took names from the place they lived), it's pretty cool. Merci Kevin! I've heard from a couple people who were wondering why I was calling polenta a French food until they kept reading. :) Someday I do want to visit Piazza Chanoux. It would be really fun to see! I hope your winter break is starting off well! Thanks for reading and commenting!